One of the prime teachings of Sithism is that as sure as Dagobahs gnarltrees will petrify, eventually Sith will Happen. 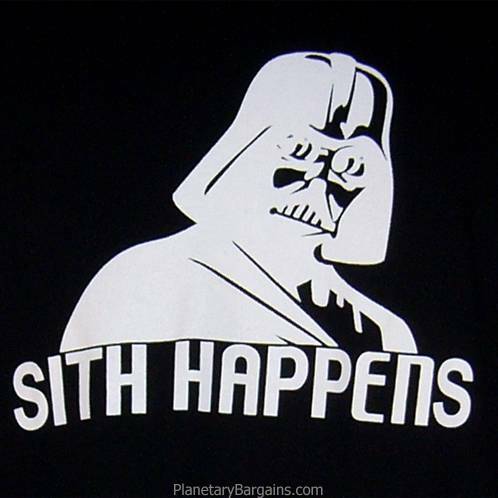 The phrase “Sith Happens” is used commonly throughout the universe to explain an unpredictable and disturbing randomness. For example, occasionally due to the inability of a nav computer to calculate asteroids deflecting off one another during the course of hyperspace, “sith would happen”, as broadcast news reported on the loss of lives, it would inevitable close the report using the phrase “Sith Happens” as a reminder to the general populous that random turns of events are sometimes unavoidable. Sometimes “Sith Happens” can be used with a air of dark humor, surveillance tapes of operation Knightfall, showed Darth Vader using the term repeatedly as he slay his fellow jedi. Often as the innocent victims fell, they asked “Why?” to which Darth would reply, “Sith Happens”.